​Welcome to our Winter Dining Series for 2018! Last years' instalment had everything from a country-inspired dining space to a dark, moody dinner party scene. Given all the love we received last year (and the fun our stylists had putting together the looks!) we're back for round two. This modern meets 70s-cool kitchen is perfect for an old-school counter lunch, read on for how to recreate this look and shop the pieces! Starting with rich timber cabinets and neutral flooring, a tactile 'crazy paving' inspired splashback is the first hint of old-school style in the space. 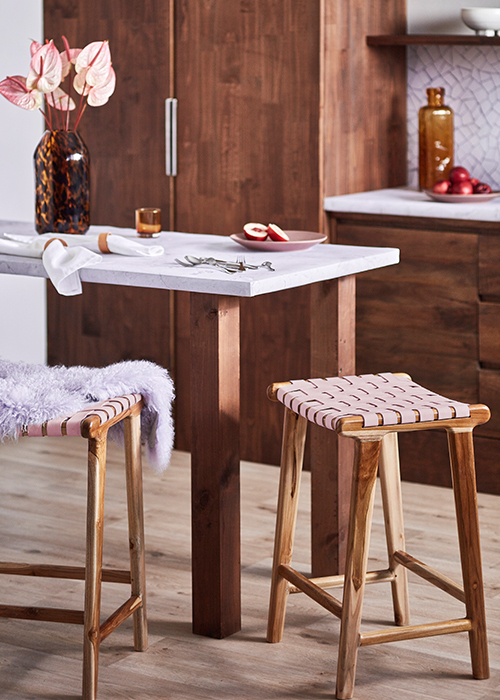 Woven leather counter stools in a subtle blush shade and a bright, patterned flatweave runner on the floor add extra layers of texture. A warm-toned canvas and floating shelves displaying bright dinnerware act as artwork, drawing the eye around the space and stitching the warm, rusty tones together. 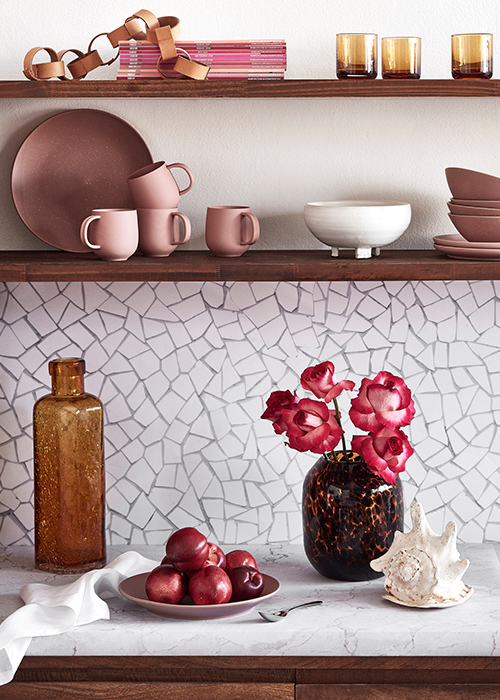 A study in warm, rich tones, the key to a stylish lunch setting is to pick a colour palette and run with it! 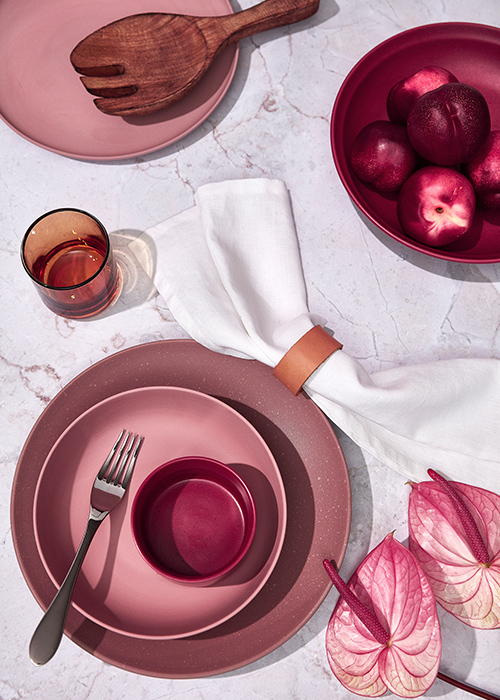 A beautiful clay-blush toned porcelain dinner set, paired with lush raspberry bowls and timber serveware sets the tone. Nothing screams 70s more than amber glassware - tinted tumblers complement the toasty tones, and a statement glass tortoiseshell vase completes the setting, full of popping pink blooms. - Choose a colour palette and stick with it for a cohesive, stylist-approved look. - Add texture! A rich, layered look needs depth through texture to temper rich colour. 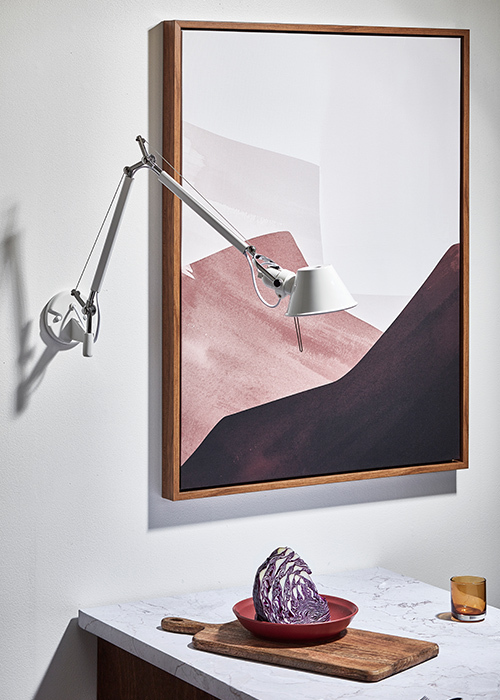 - Make the 70s look feel modern with clean, uncluttered lines and simple furniture pieces.